Unwanted Subsonics: Here are two examples of real-world small-studio recordings containing high levels of unwanted extreme low-frequency energy: a vocal (Ex08.01:WAV/MP3 ) and an acoustic guitar (Ex08.02:WAV/MP3 ). In both cases this low-frequency information serves no useful tonal purpose, so is best removed with high-pass filtering in order to preserve low-end clarity and overall mix headroom. Stereo Polarity And Phase Fixes: This audio example contains a section of a raw drum-overheads recording in which the left and right channels are out of polarity (Ex08.03:WAV/MP3 ). This results in a disconcertingly wide sound in stereo and a loss of subjective low end in mono. Matching the polarity of the two mics (Ex08.04:WAV/MP3 ) provides a much more believable stereo image and improves overall mono-compatibility. Lining up a slight timing disparity between the snare waveforms in each channel as well (Ex08.05:WAV/MP3 ) improves the attack of this instrument in mono, as well as shifting it more towards the centre of the stereo image. Inconsistent Phase-cancellation Between Layered Drum Samples: If you're going to layer more than one drum sample to create a single composite sound, then it's important that the samples are kept perfectly in sync with each other. If their relative timing shifts even slightly, then you'll find that sporadic phase cancellation will render the tonality inconsistent, as in this example (Ex08.06:WAV/MP3 ), which features a pair of layered kick drum samples. Creative Polarity Adjustment: This file (Ex08.07:WAV/MP3 ) demonstrates the creative potential of polarity adjustment when working with multi-miked instruments -- in this case a triple-miked guitar part. The four contrasting guitar tones you can hear weren't created by EQ processing, but simply by mixing different amounts of the three mics and altering their relative polarities. Tonal Shaping With Phase Rotation: Here is a 'mic plus DI' recording of an acoustic guitar (Ex08.08:WAV/MP3 ). By simply rotating the phase of the microphone signal using Betabugs's Phasebug 32-bit plug-in, I can significantly alter the combined tone of the two signals (Ex08.09:WAV/MP3 ). 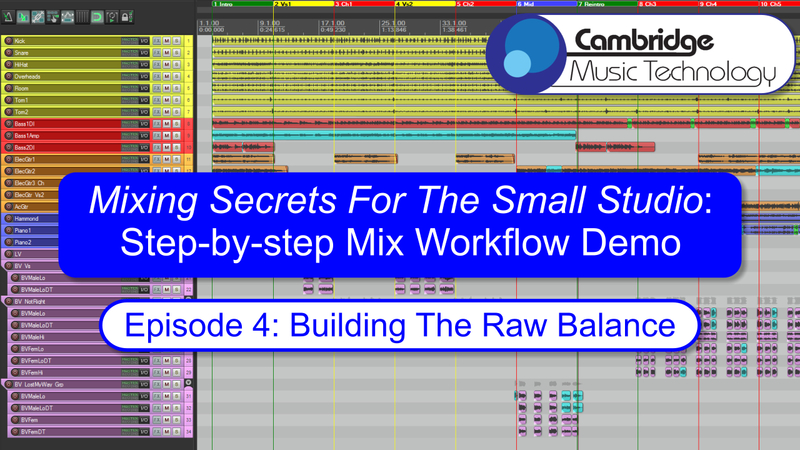 Low-pass Filtering: Given the emphasis on high-pass filtering in this chapter, reader Dave Romero contacted me to ask whether low-pass filtering should also be used in a similar way at this point in the mix. My answer to this is that low-pass filtering in such a systematic way holds fewer benefits, simply because so many instruments will have inportant harmonics and noise components that extend right up the spectrum. In practice, I find peaking/shelving cuts are therefore more appropriate for dealing with masking in most cases. That said, there's nothing wrong with low-pass filtering if you really want to kill the high end of an instrument for balancing reasons, and I do resort to it myself from time to time -- most commonly with noisy amped instruments or over-fizzy distorted DI signals. 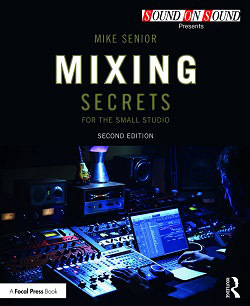 However, if you're following the book's step-by-step mixing approach, then it would be best to leave such processing until you reach Chapter 11, and I'd also advise being as sparing as you can with it, simply because it's very easy to rob the mix of 'air' if you low-pass too many things at once. Using 32-bit Plug-ins With A 64-bit Host: Although most modern software DAW systems now use 64-bit coding, there are plenty of great 'legacy' freeware plug-ins that are only available with 32-bit coding. If your 64-bit DAW system doesn't automatically 'bridge' 32-bit plug-ins, then try using jBridge , jBridgeM , or Sound Radix 32 Lives to convert them. Using VST Plug-ins On A Mac Or With Pro Tools: If you like the look of some of the freeware Windows VST plug-ins listed in these resource pages, but you're working on a Mac, check out the freeware Plugwire utility or DDMF's affordable Metaplugin . The latter can also be used to 'wrap' VST plug-ins into either RTAS or AAX format for use with Avid's Pro Tools. Affordable High-pass Filter Plug-ins: Brainworx's freeware BX Cleansweep features high-quality 6dB/octave high-pass and low-pass filters, as well as an input gain control. GVST's freeware GHi provides a more CPU-light high-pass filter with gain. Cockos's freeware ReaEQ includes 12dB/octave high-pass filtering, and multiple bands can be stacked to create steeper slopes if required. Affordable Gain Plug-ins: For preliminary gain setting and general in-DAW gain management, I use GVST's freeware GFader and GGain , although Sonalksis's freeware FreeG is another good option. Affordable Stereo-manipulation Plug-ins: My favourite width-manipulation plug-in is Voxengo's freeware MSED , but for more detailed image-manipulation facilities and vectorscope display, Flux's freeware StereoTool is great. ToneBooster's affordable TB Equalizer also has a cool frequency-dependent phase-correllation display. Affordable Phase-manipulation Plug-ins: There's lots of 32-bit VST freeware available for PC: Audiocation's Phase AP1 , Betabugs's Phasebug 32-bit, Variety Of Sound's PreFIX 32-bit, and two of the plug-ins in the Cockos ReaPlugs bundle (the all-pass filter in ReaEQ and the Jesusonic Phase Adjust module in ReaJS). Mac freeware is thinner on the ground, Airwindows's PhaseNudge 32-bit being the only free plug-in I'm aware of. If you're after something cross-platform and 64-bit, then try Voxengo's PHA-979 .